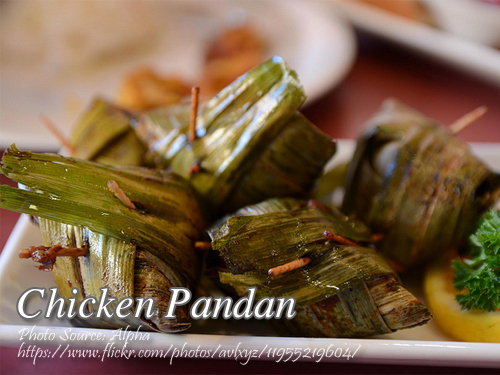 Chicken pandan is a very simple chicken dish but it looks like you have ordered it on an authentic Thai restaurant. Its because the chicken meat is marinated in a mixture of oyster sauce, liquid seasoning, sesame oil, brown sugar, garlic and cornstarch then wrapped in pandan leaves then deep fried. Since Pinoys are accustomed with the spicy Thai dishes, this chicken pandan recipe here is adapted to the Pinoy taste. To cook chicken pandan; Debone chicken thigh and mix with cilantro, chopped garlic, oyster sauce, Knorr seasoning, brown sugar, salt, cornstarch and sesame oil. Then wrap in pandas leaves. Secure with toothpick so the leaves won’t open when frying. In a pan, deep-fry chicken pandan for about 3 to 4 minutes or until done. Serve with a vinegar and garlic mixture dipping sauce if desired. Debone chicken thigh and mix with cilantro, chopped garlic, oyster sauce, Knorr seasoning, brown sugar, salt, cornstarch and sesame oil. Then wrap in pandas leaves. Secure with toothpick so the leaves won't open when frying. In a pan, deep-fry chicken pandan for about 3 to 4 minutes or until done. Serve with a vinegar and garlic mixture dipping sauce if desired. Oh so it was deep fried… I was thinking it was a stew or a soup. So the purpose of pandan leaves is to add additional flavor by its aroma? i’ve done this recipe before but later on i discovered that it is more appetizing to eat if we’ll make sauce (the engrdients of my sauce is the same w/ the ingredients in its marinate). I’ll mix all the ingridients and boil it then i’ll toss the cooked chicken after serving it.